Will Sawyer (Dwayne Johnson) is a former FBI Hostage Rescue Team leader and US war veteran. He now assesses security for skyscrapers. On assignment in China, he finds the tallest, safest building in the world suddenly ablaze - and he’s been framed for it. A wanted man on the run, Will must find those responsible, clear his name and somehow rescue his family who is trapped inside the building... above the fire line. Its plot is stupid (and extremely predictable), its characters are stupid and its (senseless) violence is stupid. 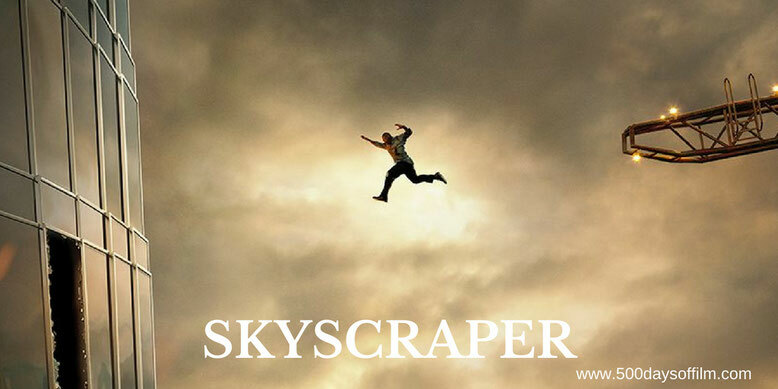 However, Skyscraper, written and directed by Rawson Marshall Thurber, is perfectly happy with its stupidity. This is a film that owns and admits its ridiculousness - Dwayne Johnson’s Will Sawyer even says the words “this is stupid” before performing yet another superhuman feat (this time with added duct tape). Skyscraper isn’t trying to be Die Hard or Towering Inferno. This film just wants us to have a good time. It gives us permission to check our brains in at the cinema door, sit back and enjoy one hour and 42 minutes of non-stop, entertaining nonsense. For all Skyscraper’s ludicrousness, it is a lot of fun. Skyscraper is, of course, another vehicle for the phenomenon that is Dwayne Johnson. Few actors could make such a film work and he is brilliant here. Like in San Andreas and Rampage, Johnson has to pull out all the stops to rescue the people he cares most about - this time with added death defying leaps from dizzying heights (oh and did I mention the duct tape?). Johnson is modern cinema’s symbol of hope. In the face of evil terrorism, heinous genetic modification and cataclysmic natural disasters, he reassures us that everything is going to be alright - that we can still be saved. Refreshingly, however, Johnson is not the only hero in Skyscraper. Will Sawyer’s wife, Sarah (a welcome return to the big screen for Neve Campbell), also has some serious skills. She is certainly no victim… thank the movie gods. Go in with a cynical eye and Skyscraper will likely disappoint. However, take your seat ready for some silly popcorn fun and you’ll have a blast.